The provisional timetable for Physical Separation '11, which will be held in Falmouth in June, is now available. 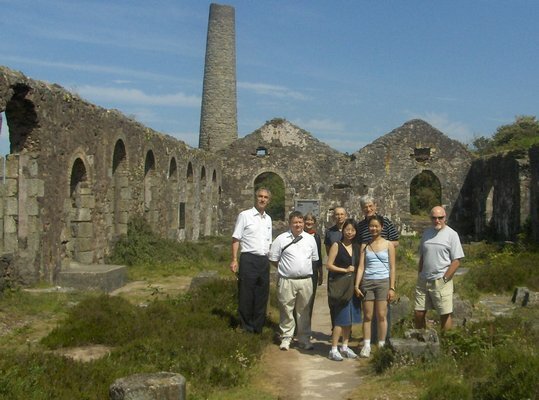 The timetable includes a tour of the historic Camborne-Redruth mining area- the birthplace of modern mining. As the timetable evolves, changes will be announced on Twitter. The registration form for the conference is also now available on the website. Physical Separation '11 immediately follows Computational Modelling '11 at the same venue, and there are discounts available for delegates attending both events. I know this will incur the wrath of some hydrometallurgists, but it is a question that has been with me for 42 years! In 1969 I was offered my first job, as a metallurgical engineer with Nchanga. The interview in London was a very relaxed affair, where the young recruiter basically told me what the job of a mineral processor entailed and how wonderful it was to work in Zambia. I expressed reservations that I knew nothing at all about copper mining or mineral processing, but he shrugged this off with “don’t worry- it’s only bucket chemistry”, which really didn’t clarify matters. It was 4 years later that this statement came back to haunt me. My first two years on the concentrator had introduced me to mineral processing, which was exciting and dynamic, following the mined ore through crushing and grinding to its separation into concentrate and tailings. After this, the practical experience commissioning the tailings leach plant had been invaluable, but my final few months spent on the high grade leach plant felt like being put out to pasture. I found the process dull and static compared to mineral processing, the chemistry was fairly simple, and metallurgical testwork was tedious, mainly involving stewing concentrates with acid of varying strengths for varying times. I have always felt that comminution is the most important process in ore to metal, and so should be the most intensively researched. It is not however- in 2008 forty comminution papers were published in peer-reviewed journals, froth flotation, the most important mineral separation technique, accounted for 96 papers, and 180 papers on hydrometallurgy were published. Of all the minerals engineering disciplines, hydrometallurgy is the only one with its own dedicated peer-reviewed journal. A major reason for this intensive hydrometallurgical research effort is that in the 1980s there was a revolution, with the development of a new branch of hydrometallurgy, biohydrometallurgy. However, another reason contributing to the profusion of hydrometallurgical research is that it can be relatively simple and cheap to perform. Comminution research requires expensive equipment and specialist researchers, while hydrometallurgical research at its very basic level, such as simple leaching, can be carried out in facilities of school chemistry standard with researchers having only a rudimentary knowledge of chemical principles. Although there are many excellent institutes devoted to high quality hydrometallurgical research, there are many more low calibre institutes around the world producing equally low calibre scientific papers which flood the editorial offices of reputable journals. Minerals Engineering, for example, rejects around 60% of all received papers, a very high proportion being hydrometallurgy related. The majority of these involve very simple experiments, involving stewing minerals in acids of varying strengths and temperatures, and reporting the results; identical work, in fact, to the routine testwork during my last months at Nchanga. A number of people have reported problems when linking to papers on ScienceDirect via Refereed Publications on MEI Online. I have had the same problem recently. Try linking to this publication. You should be able to see the full abstract, research highlights and the article outline. If these are missing, then the problem is that you have an outdated browser, as I had. I have now upgraded from Internet Explorer 7 to IE8, and the problem is solved. Brisbane is a major minerals industry centre, so we have been greatly concerned over the past week about the welfare of our many friends and colleagues in this great city. 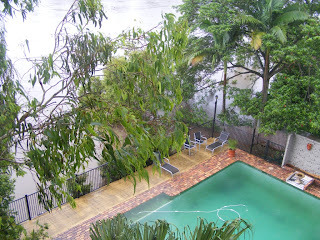 It is hard to believe that only 4 months ago we were enjoying the Queensland sunshine during the IMPC in Brisbane. Rolf Fandich of the JKTech in the suburb of Indooroopilly informs us that the floods have caused power outages at the JK Centre, bringing their servers down and making email communication via this route impossible. Some emails have been getting though, however. 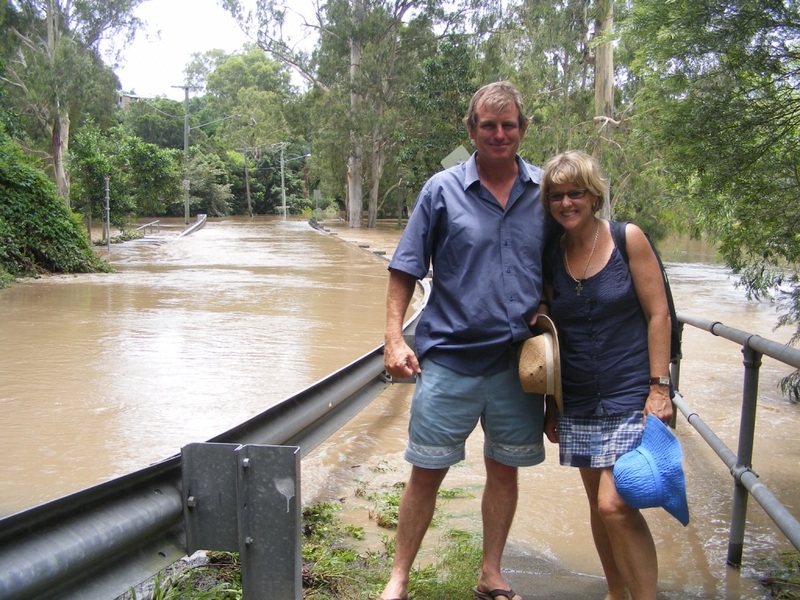 Dee Bradshaw of the JKMRC, and one of MEI's Flotation '11 consultants has managed to contact me twice and has sent in these amazing photos of her and husband Mike outside their flat on the Brisbane River. 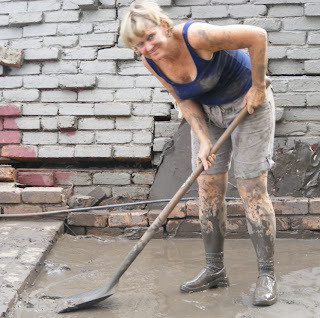 As ever Dee is smiling, and the emails we have received suggest a real 'spirit of the Blitz', where everyone is pulling together to commence the great clean up. Alan Butcher of FEI emailed on Thursday to say that the FEI offices were evacuated and he was stranded in his home in the suburbs, about 25km S-W of the city, on what had become an island prison. 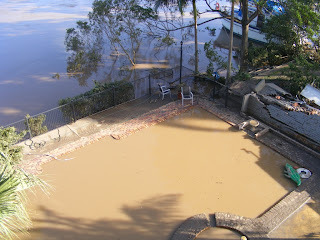 Near neighbour Tim Napier-Munn, former JKMRC Director has emailed today from his aptly named 'bigpond' server: "we have a very well organised and kind neighbour who has an emergency power generator and lent us a few watts twice a day to keep the fridge going and to send a few quick emails, so we were better off than most. Looking back, the flood was a minor inconvenience for us, but had the early predictions of a higher and longer flood been borne out then food would have become a serious issue. 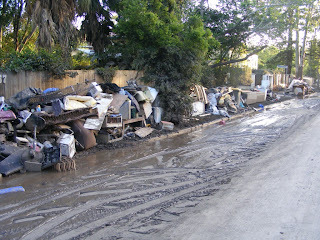 And of course many in the city suffered far worse." 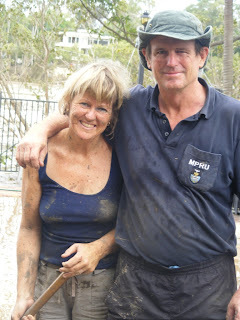 Today (Sunday) over 50,000 people are out with the mud army, on what is being called Sunday Muddy Sunday! 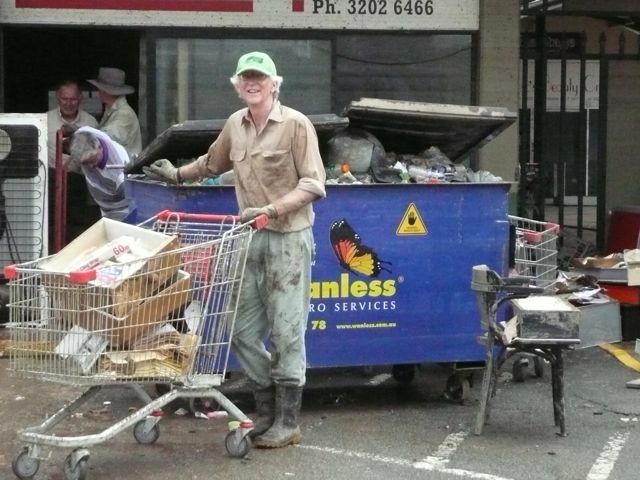 Let's not forget, however, that Brisbane got off relatively lightly, in terms of human suffering, compared with other parts of Queensland and in the devastating floods in Brazil and Sri Lanka. Our thoughts are with you all. The use of microwaves to enhance physical separation methods will be featured at Physical Separation ’11 in Falmouth in June. Already we have papers submitted from France, India and Turkey on this evolving technique. However recent developments, such as pulsed microwave technology, may overcome this. 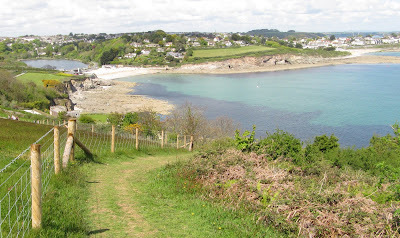 There are many aspects of mineral processing where the use of microwaves will have importance, and if you have an interest in this field, and would like to present a paper in Falmouth, we invite you to submit a short abstract as soon as possible, as we will be drafting the provisional programme at the end of this month. It is only another 4 months to the start of MEI's conference Sustainability through Resource Conservation & Recycling (SRCR) '11 conference in Falmouth. I wonder how many people are aware of the true significance of the minerals industry, and particularly minerals engineering, in any society. As I discussed in the blog post of 30 August, the minerals industry is crucial to civilisation and always has been. Ccivilisations throughout history have been based on a thriving supply of metals and minerals, and indeed the various ages of man are identified by products from the Earth- Stone, Bronze, Iron- which have played major roles in our evolution. The minerals industry is the great feeder; without it other industries, and major fields of research, such as medicine, genetics, electronics would soon cease to exist, as everything we use is either mined or grown. So why is minerals engineering so important? It has almost become a cliché in mineral processing papers to state in the introduction that processing has to evolve to treat ores that are not only becoming lower and lower grade, but are also becoming more complex and refractory. Not only that, but as well as the traditional metals required for civilisation, copper, lead, zinc, nickel etc, there are relatively "new" metals required, such as germanium and lithium, which present new processing challenges. It is clear that without continuously developing minerals engineering research, civilisation as we know it would soon cease to exist, as the hitherto unexploited mineral deposits would remain unamenable to treatment. In the 6th edition of my book Mineral Processing Technology I highlighted, in the Introduction, the inability to treat the huge zinc-lead- silver deposit at McArthur River in Australia. It ranked as one of the world's largest undeveloped deposits, with reserves estimated at 227 million tonnes, containing on average 9.2% Zn, 4.1% Pb and 41 g/t of Ag. Due to the extremely fine dissemination and intergrowth of the minerals, attempts to treat the ore by existing processing methods had proved fruitless. The 6th edition was published in 1997 so I must have written this section shortly after the publication of the 5th edition in 1992, because in 1995 the McArthur River mine commenced production, operated by McArthur River Mining, a subsidiary of Xstrata. Not until Mount Isa Mines (MIM) successfully introduced the IsaMill was the fine grinding necessary for mineral liberation available for McArthur River to be developed. The complex mineralogy, combined with the ore's relatively high lead levels, made the lead and zinc virtually inseparable prior to smelting, and there are very few smelters which can process concentrate which is high in lead. 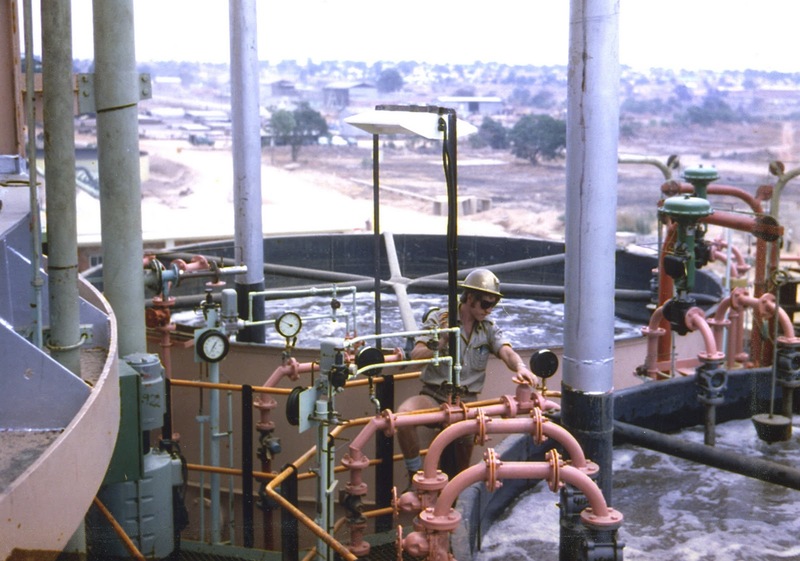 These issues led Mount Isa Mines (later Xstrata) to develop a new lead-zinc process in partnership with Highlands Pacific, known as the Albion Process, involving a hot oxidative leach of the finely ground concentrates at atmospheric pressure. The success of McArthur River is but one example of the importance of minerals engineering research, which continuously improves existing techniques, develops new ones and utilises new tools such as process mineralogy, as well as advanced computational methods for simulation and control. So be proud of being a part of this industry and take every opportunity to sing its praises and emphasise its importance, and next time you are assaulted by some misguided idealist deriding the minerals industry ask if he has any idea where the spoon came from that he is banging on the table! Hope to see as many of you as possible in Falmouth in May. The programme can be viewed here. According to the authors, models for understanding the basic concepts of fine grinding and how they apply to the design of stirred media mills have not yet matured. While spherical media in tower mills has previously been studied, real grinding media shape in stirred mills can range from spherical (steel/ceramic balls) to highly non-spherical (sand or slag) resulting in very different media and grinding dynamics. Handling the contact mechanics of non-spherical particles is a challenge for numerical models, and very few studies dealing with non-spherical particle shape exist in the literature. Discrete Element Method (DEM) simulations of dry media flow in a pilot-scale tower mill were performed for four cases with different shaped grinding media, in order to understand how flow and energy utilisation within a stirred mill depend on media shape. Differences in media transport, stress distribution, energy dissipation, and liner wear were observed in the tower mill for the spherical and non-spherical cases. A significant departure from sphericity of the media leads to strong dilation of the bed, reduced bulk density, and a reduction in active volume and collisional power levels leading to a reduction in power draw for the mill. In addition, highly non-spherical media tend to pack tightly near the mill walls forming a near solid layer around the inside of the mill shell which results in poorer transport and mixing, as well as increased wear rates on the screw impeller. Grinding performance in stirred mills appears to deteriorate strongly when using highly non-spherical media. Does anyone have any practical experience in this area? It would be interesting to have your comments. The provisional timetable for SRCR '11, which will be held in Falmouth in May, is now available. As the timetable evolves, changes will be announced on Twitter. In the wake of the recent red mud disaster in Hungary comes an opportune paper from China on the stability of tailings dams. Yin et al (Minerals Engineeering Volume 24 Number 2, 2011) present a paper on the stability analysis of a copper tailings dam via laboratory model tests. Currently in China there are more than 12, 000 tailings impoundments and almost 95% of them use the upstream method for the construction of the dam. Statistical data has shown that the tailings impoundment is one of the main sources of risk in the mining industry. Failures of tailings impoundments have resulted in the loss of many lives, considerable property damage, and irreversible pollution in downstream areas. Therefore, the safety of tailings management facilities has been of increasing concern to governments and local communities. For the stability analysis of tailings dams, the accurate profile of the dam is very important. The profiles are easily obtained for both active and decommissioned tailings facilities because their data can be collected through field investigations. However, collecting basic data from newly constructed tailings facilities is difficult. In their paper, Yin et al present a laboratory physical model test. The construction process for new tailings impoundments has been physically simulated in the laboratory, where the tailings particle composition and distribution below a beach, the change of phreatic surface of the dam, and the engineering properties of the tailings of the dam profiles have been measured. A new tailings facility, Yangtianqin tailings impoundment, owned by Tongchang copper mine of Yuxi Mine Co., was used as a case study to illustrate the physical modeling of the tailings dam. Did column flotation cells ever realise their potential? A happy New Year to all our blog readers. Metal prices have soared recently providing a fine start to the year with the promise of increased confidence in the minerals industry. The price of copper has hit a new all-time high, peaking at $9,631.75 per metric tonne on the London Metal Exchange, its highest ever level, before falling back slightly. The metal has risen 30% in value this year, with half of that rise coming in the last month, the rally being driven by the global economic recovery and most countries holding low stockpiles. Demand for copper and other industrial metals is outstripping supply, as industrial output by the emerging markets economies surges ahead of their pre-recession levels. In most parts of the world, future copper prices suggest there will be further near-term rises in the metal's value. Meanwhile, precious metals have shot up amid fears over the debts and loose monetary policies in Europe and the US. The price of palladium rose 94% this year.